If you’re following my hikes, then you’re probably aware that I’ve been slowly ticking off the 100 highest peaks in San Diego County one hike at a time. 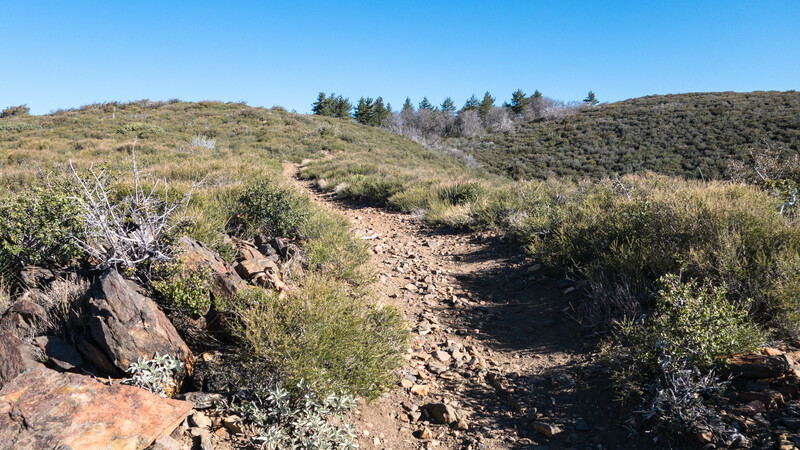 On Monday this week, I headed to the Laguna Mountains where I hiked Garnet Peak and Pine Mountain Trail, my 17th and 18th peaks. 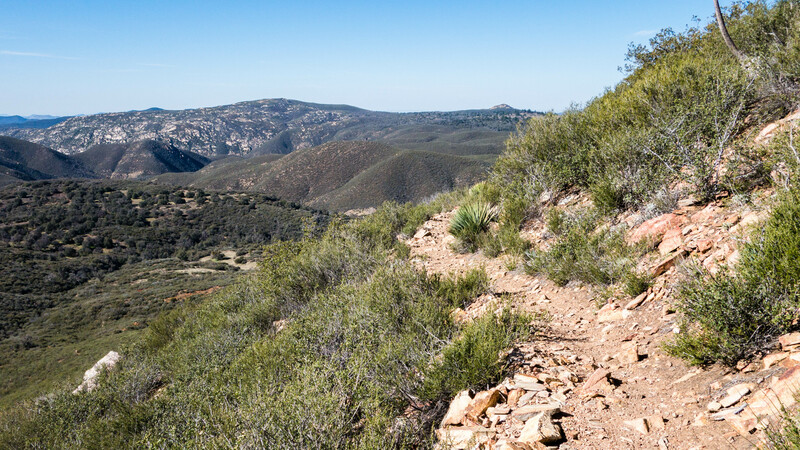 Both hikes are written up in Jerry Schad’s hiking guide Afoot & Afield: San Diego County. Schad’s write-up for Garnet Peak leads you on a direct, easy-to-follow ascent up the mountain to its highest point. The write-up for Pine Mountain Trail, however, explicitly excludes any hope of visiting the summit. I knew the summit of Pine Mountain is accessible, I just wasn’t sure how to get there. 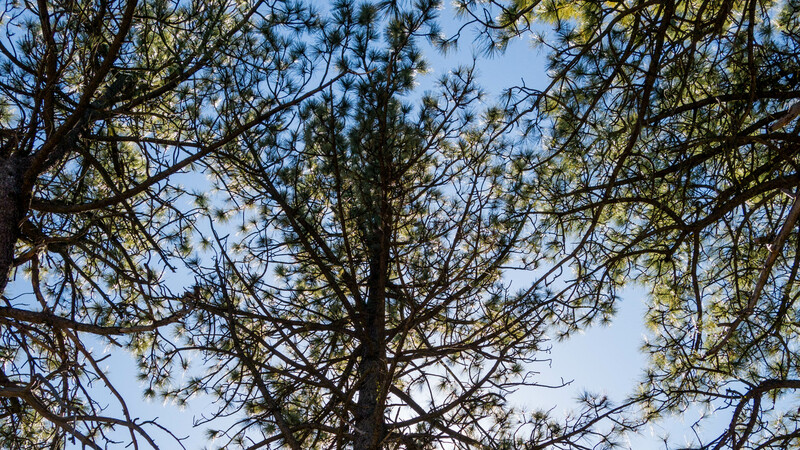 Armed with little more than a starting point for the hike, a GPS device, and a map and compass, I hit the trail to find my way to the summit of Pine Mountain. 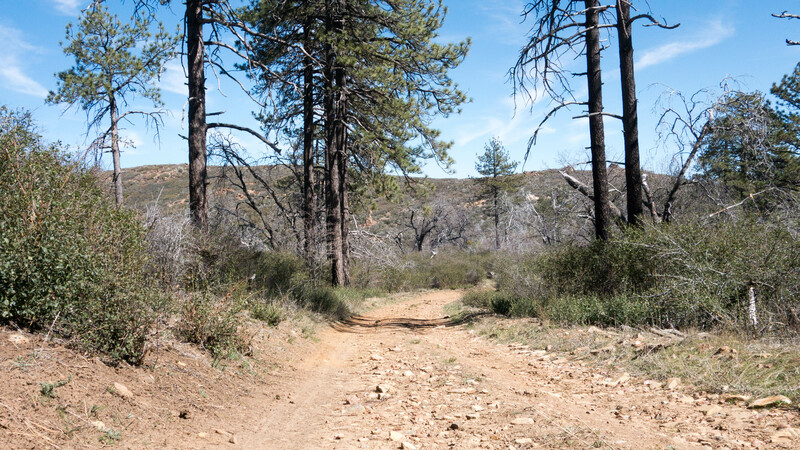 Pine Mountain Trail is easily accessible from the trailhead near mile marker 29.3 on Sunrise Highway. It is clearly marked and starts off easily enough on the west side of the highway. The trail is well travelled and frequented by hikers and mountain bikers, as evidenced by the fresh tracks all along the trail. Even so, in the five hours I spent hiking the trail, I never crossed paths with a single other person. Shortly after leaving the trailhead, I reached a four-way junction at Indian Potrero Road. I crossed the road to follow a sign that said “Pine Mountain Trail” and continued hiking southwest. Above me to the northwest, I could see the pine tree covered summit for which the Pine Mountain is named. 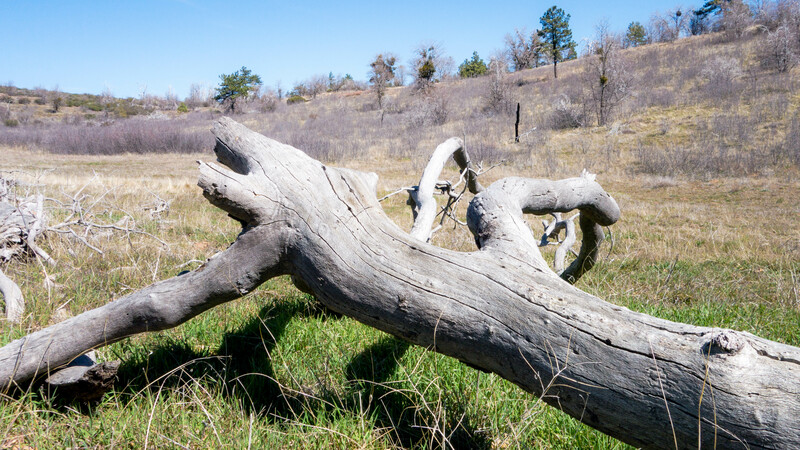 I was confident that if I just continued working my way along the trail, eventually I would find a way up. At around 2.5 miles into the hike I arrived at the Indian Creek Trail crossing. To my left, the trail took a direct path south into the valley toward Indian Creek and away from Pine Mountain. I quickly ruled that out as an option for reaching the summit. 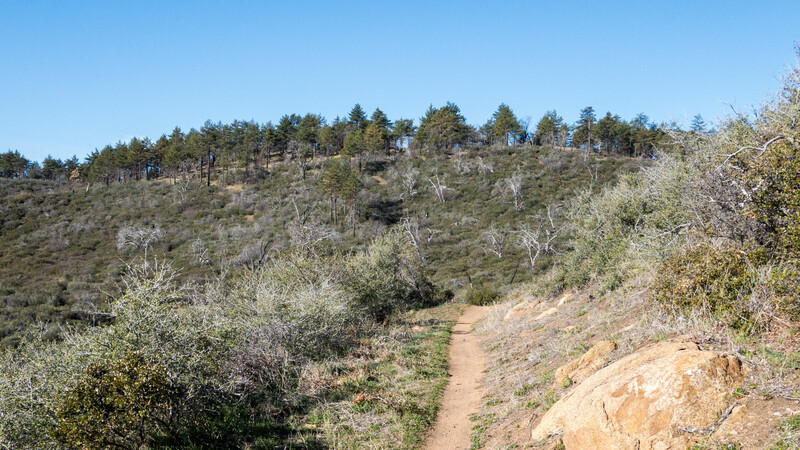 To the right, the trail headed northwest toward Pine Valley Creek and the Cuyamaca Rancho State Park boundary. I wasn’t excited about the prospect of heading downhill when all I wanted to do was go uphill, but my map offered a tiny glimmer of hope. According to my Tom Harrison San Diego County topographic map, I should reach a connecting trail in a mile or so if I followed the trail west. 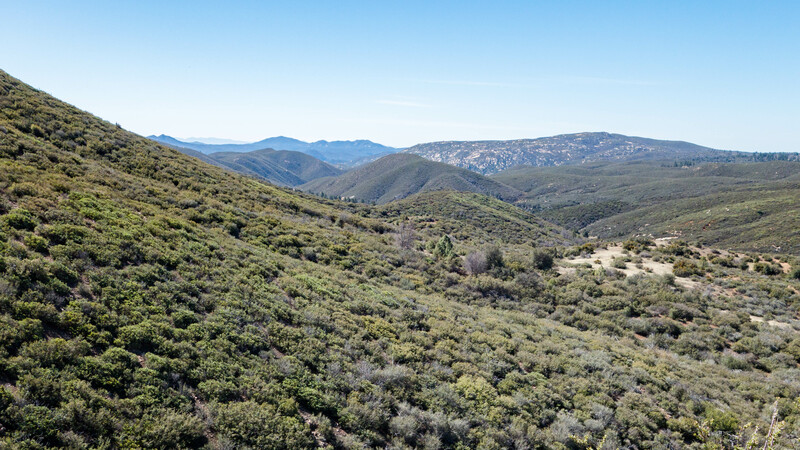 The connection, according to my map, would cut across the hillside to Indian Potrero Road, a fire road that would lead me back up the north face of Pine Mountain. This shortcut, if I could find it, would shave about 4 miles off my hike. Cautiously optimistic, I folded up my map, threw my pack back on and followed the trail west into the valley in search of the shortcut my map was promising. Shortly after leaving the intersection I passed the point where I thought the shortcut should be. The topographic lines on my map indicated that it was located somewhere around 5300 feet in elevation. My GPS was telling me that I was 100-200 feet below that level and descending rapidly. Still I had hope, so I continued on thinking that maybe the map was a little off in scale. As I fell below 5000 feet, I knew for sure that I wasn’t going to find the shortcut my map had promised. I was once again posed with a dilemma; head back and call it a day, or hike the extra four miles to the north side. I opted to continue my descent into the valley eventually landing on Deer Park Road, a fire road paralleling the Cuyamaca Rancho State Park boundary. I followed Deer Park Road north along the boundary to Indian Potrero Road where I would begin my ascent back up the northern face of Pine Mountain. The hike up started off slowly, but soon I was greeted with an ever expanding view of the valley below and distant neighboring peaks to the southwest. My spirit was refreshed with the rewarding scenery and my optimism renewed. Soon, the pine tree covered summit was once again in clear view, and I was closer to it than I had been at any other point on the hike so far. Then, all at once, the trail opened up and the summit was sitting directly in front of me. The top of the mountain is made up of a series of rolling hills that are covered with grass and pine trees. It was like an oasis in an otherwise barren desert. The only problem was that the trail I was on appeared to go around and not to the summit. Then I found it. Years old tire marks, covered in grass and only faintly visible going off trail, across the field and up into the pine trees. A sign near the tire marks said, “No Vehicles.” Nothing about feet or hikers, so off I went, following a faint path to the summit. The tracks soon faded away, but my path was clear and a quick look at my map told me where I could find the summit. The hills were covered in thick layer of grass and fallen leaves that were practically undisturbed, but there was evidence of light use. I’m not entirely sure if the spotty path I followed was made by by previous hikers or local wildlife, but it was just clear enough to follow. We’re so often caught up in the moment that we forget to take notice of what’s going on around us. I started hiking to distract myself from my daily life and to get into better shape. As I became a stronger hiker, I started setting goals and challenging myself with longer distances, higher elevations, and faster times. Since starting this blog, I’ve been forced to slow down and take the time to notice the world around me while I hike. Allowing nature in has opened up a whole new world for me. I still like to challenge myself and push my limits, but it’s no longer a singular focus. Moments like this one, standing under the shady pines on top of this mountain, will stop me dead in my tracks. This is why I hike, for moments just like this. Invigorated with a sense of accomplishment and refreshed by the experience, I ventured on. Soon I was standing atop the highest point on Pine Mountain. The views were obstructed by the forest around me and the moment had passed. It was time to leave this beautiful place and finish my hike. After walking a couple of hundred yards north I was back on Indian Potrero Road. From here it was a quick and relaxing 2 mile hike back to my truck, where I would briefly reflect on my experience before returning home. This is a great report of your hike. I’ve hiked on this area and I would agree with you about the importance of slowing down to enjoy nature. It usually takes me longer than planned when I hike because I like to stop to enjoy the place and take pictures. Hiking is never just about exercising for me, I do it more to relax my mind and energize my spirit. Thanks for sharing your experiences on the trail, I love readying this! I’m slowing down more and more these days as my priorities continue to shift. More pictures and just enjoying the moment, and less hiking. Thanks for sharing, and I’m glad you enjoyed it!